Looking for a Bandicam review? 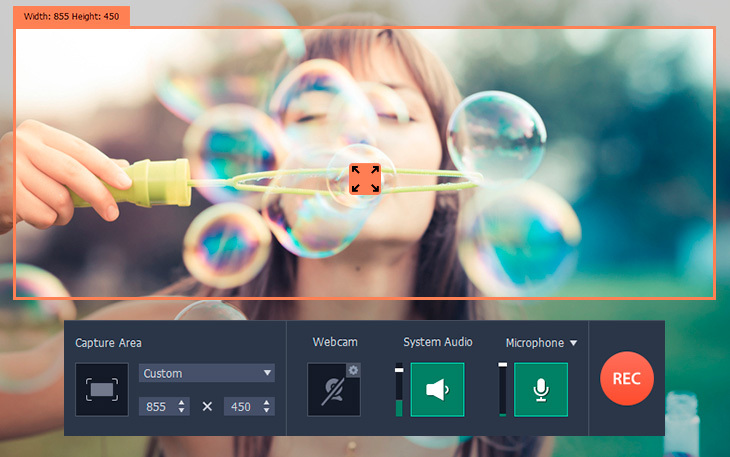 Bandicam by Bandisoft is a fairly popular screencasting tool. Not among Mac users, though, as there’s no version for their system. As for the Windows version, it lacks some key features offered by other publishers at a more reasonable price. So before wondering how to get Bandicam, it’s probably worth it to check out the alternatives. For instance, there’s Movavi Screen Recorder Studio – it has most of Bandicam’s recording options as well as a built-in video editing tool, and it’s available for both PC and Mac users. Both screen recorders have an intuitive, sleek-looking interface with a conspicuous REC button and a minimum of settings. Hardly anyone, no matter how inexperienced they may be, would find it difficult to navigate through either of these apps. Most features are quite similar. However, Movavi Screen Recorder Studio also offers the option to record video and audio from different sources as individual tracks. This may be helpful, say, if you want to capture your desktop and webcam and then edit them separately. And if you’re thinking about how to record your voice when editing your captured video, you’ll do better with Screen Recorder Studio because Bandicam doesn’t have this capability. As you can see, the options in BandiCut are restricted to splitting and cutting your videos, whereas Movavi Screen Recorder Studio offers a whole range of features. With the latter, you can edit your screencasts by adding music, inserting various special effects, transitions, and titles, and much more. Now let’s have a look at the formats and export options in both apps. 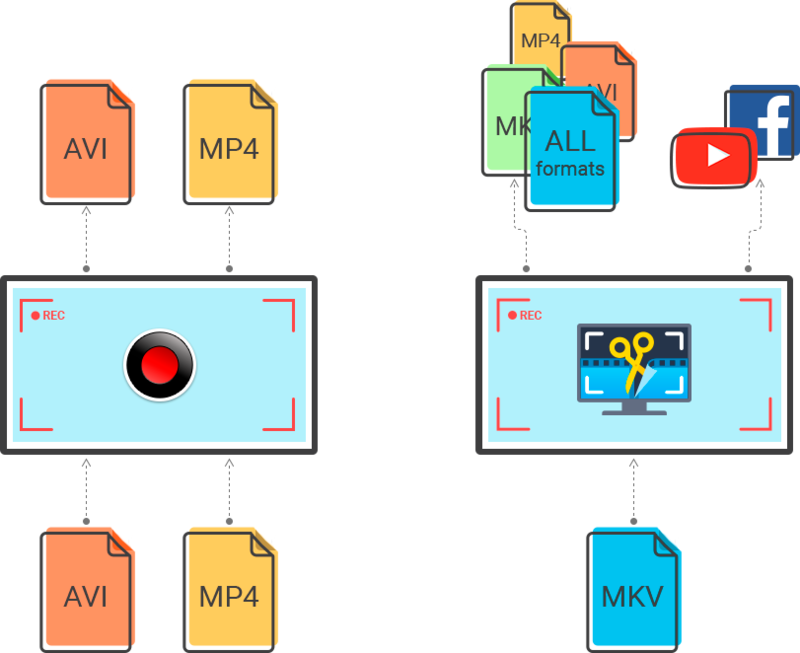 The formats offered for recording are very different: AVI and MP4 in the case of Bandicam and MKV if you use Screen Recorder Studio. However, the latter program works with multiple formats and codecs, enabling you to export your screencasts in the format that best suits your needs for any mobile device: AVI, MP4, MOV, WMV, FLV, 3GP – the list goes on. If you want to share the resulting videos on Facebook, YouTube, or Amazon’s S3 cloud storage service, you can do it directly from the Movavi software. Bandicam has no such feature. Both Bandisoft and Movavi websites provide numerous video tutorials on different functions of the programs that receive regular updates and expansions. Bandisoft even has guides explaining how to use Bandicam to record audio and video footage from specific games like Minecraft and Grand Theft Auto. However, Movavi hosts a more extensive collection of manuals and how-tos detailing every step a user needs to take in Screen Recorder Studio to achieve the desired effect. Also, the live chat service set up by Movavi helps users to solve problems even more quickly – a feature that is absent from the Bandisoft site. Bandicam alone (only screen recorder) is $39 and the Bandicam + BandiCut bundle (screen recorder and video cutter) is $60. The full version of Movavi Screen Recorder Studio, though, is $59.95, which gives two full apps for the price of one: a handy screen recorder and a powerful video editor. The latter seems like a significantly better deal than paying $39 for the Bandisoft screen recorder with no video editing features or $60 for the screen recorder and basic video cutter. Share your videos on YouTube, Facebook, etc. Just download the Screen Recorder Studio installer, launch the program, and discover all its extensive features.